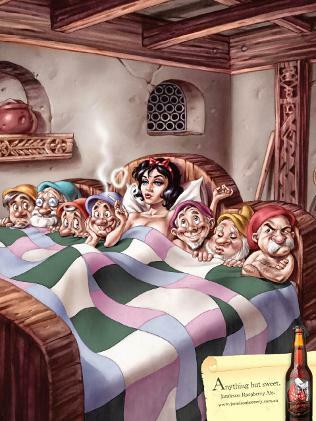 Funny thing….Disney apparently didn’t like this rendition of Snow White, and has contacted the ad agency in question, according to The Register. Funnier still is that Grumpy still looks, well, grumpy. I suppose one could try to argue that Snow White and the Dwarves aren’t really owned by Disney, as they come from the Kinder- und Hausmärchen. I doubt one would get too far with that, though, especially since these are obviously styled to look like the Disney rendition. Hat tip to my friend Hayden, without whose Facebook feed this one would’ve gotten by me. Gotta love that hat in the finale! Disney Netpal Creeps Me Out! You won’t be finding the Disney Netpal in my house. This week’s Jentasmic! tells you why. The bottom line? Who could argue against parental controls that create a web-safe computing environment for kids? Not me, unless, well, that parental control system is designed by a corporation with a vested interest in making sure your kids are interested in their content, and theirs alone. I just can’t get excited about Celebration Vacations, Disney’s 2009 marketing promotion. But I gotta tell ya, I bought 80 postcard stamps today. Since about January, I’ve been sending in the postcard entries for Year of a Million Dreams. It’s strange how attached I’ve become to the daily ritual of hand-addressing my postcard and stopping by the mailbox. I was actually about to give it up last week, after a third pair of Mickey Dream Ears had arrived in the mail. Because yes, I have indeed won some prizes in this sweepstakes. Two pairs of Dream Ears arrived on the day my son graduated from elementary school (a bigger day than I would have imagined), and this last pair arrived on a weary September afternoon, when perhaps I’d supervised one too many hours of homework. I’ve also been lucky enough to win a few things in the Parks: A Dream Fast Pass at Disneyland, a couple trading pins, a couple of lanyards for my son and me at Magic Kingdom. And a bittersweet memory: The American Wishing Tale Dream, which we won just two days after my son had been through some unsettling medical tests (which, thank goodness, turned out just fine). The success of the campaign over the long haul may depend in part on how well Disney continues to support its Cast Members in creating the magic, and in managing Guest expectations. Will the Cast Members burn out after month upon month of going beyond even their usual level of consistent cheerfulness? Have the Guests’ expectations been raised to an unreasonable level, and will there be backlash from those whose Dreams don’t come true? Already The Disney Blog has raised the question of whether low-level prizes are being awarded in a manner inconsistent with the rules (and perhaps in violation of the Americans with Disabilities Act), and certainly plenty of Guests have been frustrated to be almost in the right place at the right time, as they watch Dreams awarded to others. But the casual, occasional Disney visitor probably isn’t paying enough attention to have their hopes raiesed as high, and it’s hard to imagine the Disney Faithful changing their park attendance patterns just because they didn’t get handed a free pin. Year of a Million Dreams might well turn out to be a stroke of marketing genius, if Disney can keep it up. But the real heart of the Disney magic is the Cast Members who go above and beyond the call of duty to create those special moments for Guests. Our Segway-riding friend Chris didn’t need any special campaign backing him up to make our evening a little more magic, he just did. Let’s hope that Disney gives Chris and all his colleagues the support they need to keep that magic going. As far as I’m concerned, that part of the YOMD doesn’t have to end.